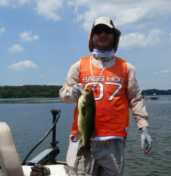 THEBASSHOG.COM - Bass, Fishing, Hunting, Outdoor Recreation. This site can make you a Bass Hog too! "THEBASSHOG.COM® " presents live coverage of fishing events and adventures. In the future we will carry coverage of tournaments, practice sessions and the overall good times we have while fishing, courtesy of a video camera, advanced wireless technology, and a lap top computer. THE BASS HOG’S®NEW BLOG for those who don't want to join a social networking site! The Number One Spot for BASS Fishing Information, Friends and Fun!!! LOCATED IN SUBURBAN NORTHERN VIRGINIA, USA. WILLING TO TRAVEL TO YOUR FAVORITE HOT SPOT OR TAKE YOU TO ONE OF MINE. JUST GET IN TOUCH THROUGH THE SITE. "High School Bass Fishing Tournaments!!! "-Start you own! "Bassmaster College Bass Fishing!!! "-Start you own. "FLW College Bass Fishing!!! "-Start you own!